This season, Steven Smith marks his ninth and final season as Music Director of the Richmond Symphony and his eighth season in the Lewis T. Booker Music Director Chair. During his tenure, the Richmond Symphony has significantly expanded its repertoire and broadened public engagement, while also enjoying increased ticket sales and enthusiastic critical acclaim. In addition, the Richmond Symphony has recently received special recognition from the National Endowment for the Arts and the Virginia Commission for the Arts for its innovative programs, including the major initiative of the ‘Big Tent’ which has made possible free outdoor concerts and a new level of collaboration with the Richmond community. Richmond audiences have also enjoyed Richmond Symphony appearances by noted guest artists such as Itzhak Perlman, Joshua Bell, Lang Lang, Rhiannon Giddens, and Savion Glover. A major commission and commercial recording of Children of Adam by Mason Bates brought the 60th anniversary season of 2017-18 to a rousing conclusion. Steven Smith also continues as Music Director of the Grammy Award-winning Cleveland Chamber Symphony, which produces the annual NEOSonicFest, a festival of contemporary music, this year celebrating its sixth anniversary, and from 1999-2013 was Music Director of the Santa Fe Symphony & Chorus. During his time in Richmond, Steven Smith has been delighted to collaborate with other performing groups in the region, including the Richmond Ballet’s 30th anniversary celebration in 2014, and the Virginia Opera’s production of Mozart’s Le nozze di Figaro in 2013. He has appeared as guest conductor with orchestras such as San Francisco, Milwaukee, Houston, Detroit, Tulsa, Jacksonville, Puerto Rico Symphony, and the Aspen Music Festival. Abroad, he has performed with the Hong Kong Philharmonic, New Zealand’s Auckland Philharmonia Orchestra, National Taiwan Symphony Orchestra, and Mexico’s Orquesta Sinfónica de Xalapa. 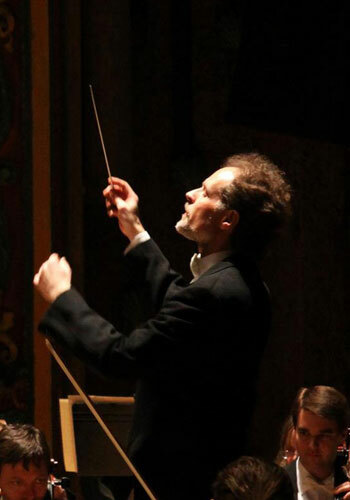 In addition, he has conducted numerous opera and orchestral performances at Indiana University, the Cleveland Institute of Music, and Brevard Music Center. Steven Smith is an ASCAP award-winning composer, with commissions from The Cleveland Orchestra, Cleveland Orchestra Youth Orchestra, Grand Rapids Symphony, Eugene Youth Symphony, and solo artists. His works have been performed throughout the United States and in Europe. He was named Ohio Composer of the Year for 2008.